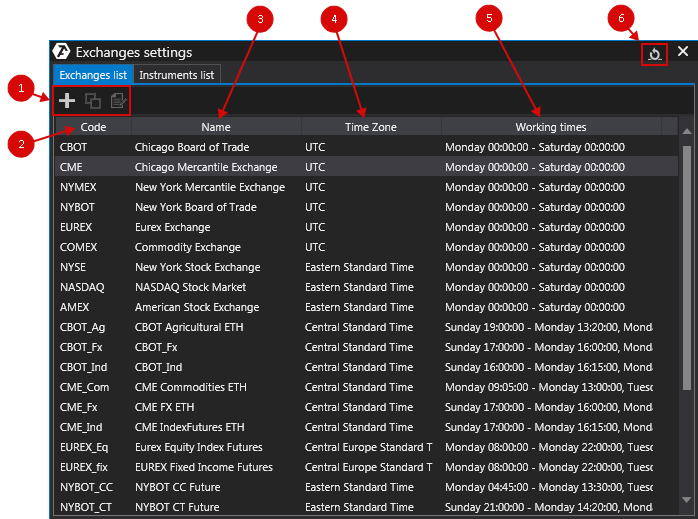 Exchanges settings - this function is needed to fine-tune the time of trading sessions on various exchanges and each instrument separately. Beginning of the session marked on charts. The settings window opens, which consists of 2 tabs: Exchange List and Instrument List. The Exchange List tab allows creation of templates and the customization of parameters of trading sessions for each platform. New - add a new exchange. 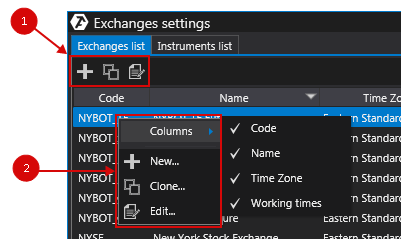 Clone- copy the parameters of an exchange from the list of available exchanges. 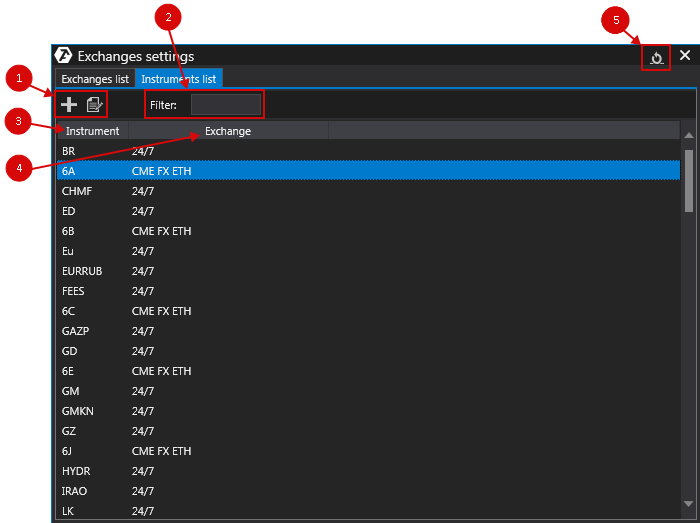 Edit - change the parameters of an exchange from the list of available exchanges. 2. Code: a short ID of the trading platform that will be used to assign platforms to each instrument. 3. Name - this option indicates the full name of the trading platform. 4. 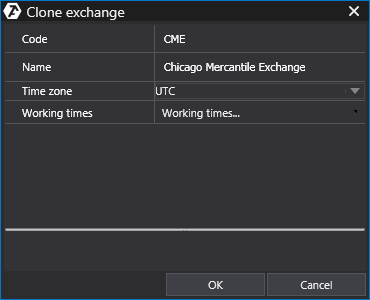 Time Zone: selecting the local time of the exchange. 5. Working times: creating a schedule for trading sessions for the platform. This window features an extensive list of trading platforms with default settings, but you can add and configure new exchanges, copy the settings of an already existing exchanges (from this window), and edit the existing trading platforms, if necessary. Buttons on the window panel. Context menu, which is opened by right-clicking on the list of exchanges. * You can also adjust the display of window columns using the context menu. Right-click on the list of exchanges, then left-click on Columns in the pop-up window, and select or remove the necessary columns in the list. 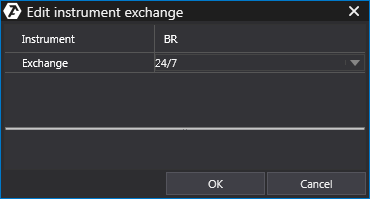 * When adding a new exchange, the Code and Name lines will be empty! Code: a short ID of the trading platform that will be used to assign platforms to each instrument. Name - this option indicates the full name of the trading platform. Time Zone: select the local time of the exchange. Working times: creating a schedule of trading sessions for the platform. Start day: day when the exchange operation starts. Start time: time when the exchange operation starts. End day: day when the exchange operation ends. End time: time when the exchange operation ends. The and buttons are used to add new and to delete existing sessions, respectively. To save all the changes, click OK. The Instrument List tab is designed to assign a platform to each instrument with preset trading session parameters. New: add a new ticker. Edit: edit the ticket from the window list. 2. Filter: the function for a quick search for the required instrument by entering the ticker. 3. Instrument: the abbreviated name of the instrument in the form of a ticker. 4. Exchange: exchanges with preset trading session parameters. The context menu, which is opened by right-clicking on the list of tickers. 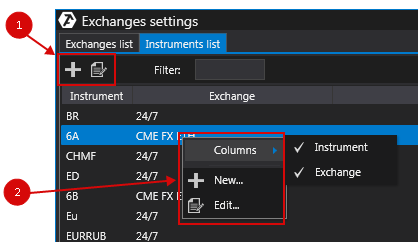 *You can also use the context menu to adjust the display of window columns by right-clicking on the list of exchanges, then left-clicking on Columns in the pop-up window, and select or remove the necessary columns in the list. Exchange: select a platform with present trading session parameters.